I never like much being told what I can and can’t do, and so when I started picking up leaflets about composting, which told me what I could put on the compost and those things I couldn’t, I thought why not! You know the sort of thing, it always says, ‘no cooked food.’ Well of course it is pretty bad wasting cooked food in the first place, but then to send it to landfill is another crime in my book. The reason not to add cooked food is not because it won’t compost but because it attracts rats and so you need a composting system that rats cannot access. I started visiting schools to look at their compost and, almost invariably, they had one or two ‘dalek’ bins, so called because they look a bit like daleks. Nearly all the ones I saw were filled up with rotting fruit waste usually accompanied by a cloud of fruit flies; not pleasant! 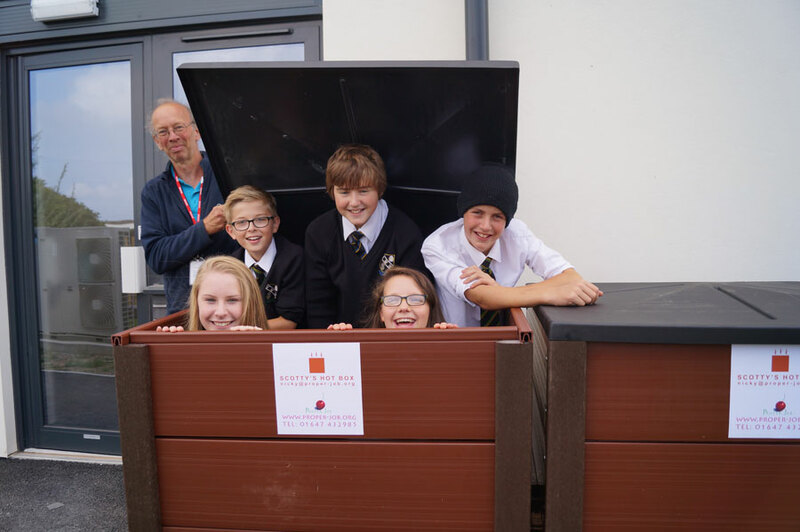 There had to be a better way than this and so I started trialling different composting systems in schools and, fast forwarding several years, we have, in Devon, come up with some really good solutions. Compost making is really very simple as long as you make sure that you balance air with water. In other words materials full of water such as fresh fruit and vegetable peelings must be mixed with tougher dry materials to allow air to percolate through the mass of material, whether it is tumbled, turned or just static. Unfortunately schools are usually in short supply of such material and so they have to get it in from outside. You can buy pelletised sawdust, which is good, or woodchips, shreddings etc. these are often available free and a parent or governor at the school might well be able to supply this material for free, ask around! I’m always asked whether you can use paper or cardboard instead and whilst they are good at mopping up liquid they then pack down and do not allow an airflow through. So you must have tougher materials like woodchips, dry plant stems, twigs etc to allow air through the heap. The hardest part about getting composting to work in schools is the attitude of the staff, particularly the head teacher and often the caretaker, if they are keen and positive, then it will take off and work well, if not then it can waste a lot of time. The children always get it and generally love to be involved in the process. I am now joint chair of the Growing Devon schools partnership www.growingdevonschools.org As well as the co-ordinator of the Devon Community Composting Network www.dccn.org.uk We are working to help schools grow, cook, eat and compost their own food and also involve this into the curriculum and have produced ‘The Compost Curriculum’ for teachers. Why not start a wormery to turn your food scraps into ´Black Gold´ compost? Keeping a few hens is relatively simple and the rewards are many. In exchange for a bit of garden you will get nutritious, delicious, fresh eggs and the pleasure of observing your hens go about their daily business. Chickens are quite therapeutic to watch as they amble about chattering contentedly or run flat out with sheer joy (once seen you can never reconcile with a factory system that keeps hens in cages). Outstretched sun bathing or dust bathing in an ash pit/dry mud patch to control their parasites. Even watching the relish with which they drink fresh water or all crowd around a dish of food (like the wooden child's toy of hens pecking in a circle). Or just seeing them lined up, roosting on a fallen tree or garden bench. I've had so many hens sharing the garden - from beautiful little bantams to huge fluffy gentle Brahmas and many in between. Some have been lost to foxes, some to dogs, some to disease but most have had long, happy and healthy lives. - enough space for each hen to have quality of life protected from predators (see above) preferably with an electric fence. Electric fences are a bit of a financial investment but after you have seen a few of your beautiful birds in their prime, laid out by fox or dog, you will see the sense. - a dry, warm, clean house which can be anything from an old converted shed with nest boxes and roosts,to a deluxe eglu - the chickens won't mind which. If you only have a small space keep two or three hens. If you have more you can have a bigger flock. Don't be tempted to overfill your space - chickens can quickly reduce a large grassy area to a mud bath so try to find a harmonious balance for the land and the chickens. Extra benefits - their waste in the compost, the pests and weeds they eat, great at turning over the vegetable plot between planting. They will turn over your borders as well though so if your garden has precious areas protect them from your hens.